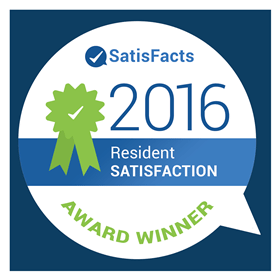 BETHESDA, Md., May 2, 2017 – ROSS Management Services, a leader in multifamily property management in the Mid-Atlantic region, today announced that it has attained a Superior Company Score in SatisFacts’ 2016 National Resident Satisfaction Awards. This marks the third straight year the company has achieved this designation. ROSS won the award based on scores residents gave the company on satisfaction surveys during 2016. The company received an average score between 4 and 4.49 for the year, placing it in the Superior Company Score category. Furthermore, 12 ROSS-managed communities received individual 2016 SatisFacts Property Awards, having achieved an average score of at least 4 on their resident satisfaction surveys last year. ROSS Management Services partners with SatisFacts to deliver customer satisfaction surveys to its residents at various touch points during their lease term – at move-in, after every work order and prior to renewal – to determine their satisfaction with the level of service they have received. Metro 710 Apartments in Silver Spring, Md. ROSS Management Services has received an award from SatisFacts’ National Resident Satisfaction Awards every year since it began working with the company to conduct resident surveys.